Most Test teams, irrespective of their place in the hierarchy of Test cricket, tend to do better at home than away. Even at home, most teams have certain grounds where they tend to excel and have better Win-Loss ratios compared to other grounds at home. This could be due to the pitch conditions or just having a feel-good factor at that particular ground. 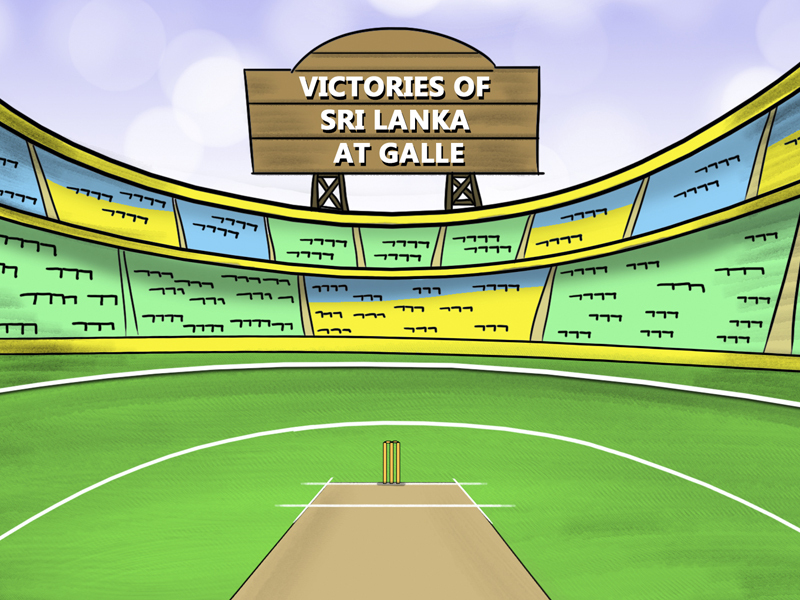 There is no doubt that Galle has been a fortress for Sri Lanka in Tests. Out of the 8 grounds that have hosted Tests in Sri Lanka, Galle has given the Lankans the 2nd most number of victories, as well as the best Win-Loss ratio of any ground at home that has hosted a minimum of 10 Tests. The pitch at Galle is a slow turner with appreciable purchase for the spinners right from the start. The spinners, now led by Rangana Herath, exploit the conditions to the maximum. Here are the 4 biggest Sri Lanka victories at the Galle International Stadium since 2015, before their 278-run win against South Africa. Sri Lanka won the toss and elected to bat. Dimuth Karunaratne and Dinesh Chandimal helped themselves to centuries, scoring 186 and 151 respectively, as Sri Lanka piled on a massive 484 all out. Apart from these two batsmen, no other Lankan batsman even scored fifty. The pitch was offering assistance to the spinners and Devendra Bishoo took 4 wickets, conceding 143 runs. When it was West Indies’ turn to bat, the pitch had deteriorated a bit and Herath is a master in such conditions. Only Darren Bravo managed a valiant fifty as the West Indies capitulated to the canny spin of Herath. He spun a web around the West Indies batsmen, taking 6 wickets for just 68 runs from his 33 overs as the Windies were dismissed for 251. Sri Lanka had a lead of 233 runs and enforced the follow on. The 2nd innings was a familiar story for the West Indies as they struggled to put together partnerships, even though Jermaine Blackwood scored an enterprising 92. However, he received very little support as Herath weaved his magic yet again and the West Indies were bowled out for 227, losing by an innings and 6 runs. Herath took 4 wickets in the second innings, taking his tally in the Test to 10, and he was rightly adjudged the Man of the Match. Unlike most pitches at Galle, this pitch wasn’t a rank turner. Batting first, Sri Lanka bossed their way to 494 all out. Kusal Mendis scored 194 while Asela Gunaratne, Niroshan Dickwella and Dilruwan all scored fifties, propelling the Lankans to their formidable total. In reply, Tamim Iqbal and Soumya Sarkar started well and registered a century partnership before a collapse led to them being dismissed for 312, giving the hosts a lead of 182. In the second innings, it was Upul Tharanga’s turn to shine as he scored a brilliant 115. The Lankans declared at 274/6, setting Bangladesh an almost impossible target of 457 to win. Apart from the 1 wicket taken by the medium pace of Gunaratne, all the wickets fell to the spinners as Bangladesh folded meekly for 197. They lost by 259 runs as Herath once again ran riot, taking 6 wickets for 59 runs. Kusal Mendis was named the Man of the Match for his blazing century in the 1st innings. Sri Lanka won the toss and opted to take first strike. They were soon tottering at 9/2 before Kusal Perera and Kusal Mendis repaired their innings with a century partnership for the 3rd wicket. Starc took 5 wickets for just 44 runs but the hosts, aided by fifties from Mendis and Angelo Mathews, posted an above par total of 281. Mendis and Mathews scored 86 and 54 respectively while Kusal Perera chipped in with 49. In reply, Australia had no answer to the spin twins, Herath and Dilruwan Perera, who each took 4 wickets as the Aussies were bowled out for 106. Only David Warner (42) and Mitchell Marsh (27) made any score of substance. The Lankans had a lead of 175. In their 2nd innings, Sri Lanka were reduced to 98/5 before the lower order made useful contributions to add a touch of respectability to their score. Dilruwan Perera followed up his good show with the ball by top scoring with 64, while Dhananjaya De Silva and Herath chipped in with 34 and 26 respectively to enable the Lankans to score 237. Australia, set a target of 413, were never in the hunt once they were reeling at 10/3. Warner was again the highest scorer for the Aussies with 41, and Dilruwan Perera had a brilliant conclusion to a brilliant match, taking 6/70 as Australia were bowled out for 183 to lose by 229 runs. Dilruwan was named the Man of the match for his 10 wickets and 80 runs. This match was not a comprehensive win for Sri Lanka in terms of runs, but it was a spectacular come-from-behind victory. At one stage, Sri Lanka looked down and out but pulled off a miracle to win. The Lankans batted first and were bowled out for 183. Even that represented a mini-recovery as they were reeling at 60/5 at one stage. Ravichandran Ashwin unleashed his full bag of tricks as he claimed 6/46. In their 1st innings, India were in trouble at 28/2 before Shikhar Dhawan and Virat Kohli both struck magnificent centuries in a 3rd wicket partnership of 227. However, once Kohli was dismissed for 103, the last 7 wickets added just 120 runs as India were bowled out for 375, giving the visitors a lead of 192 runs. In their 2nd innings, the hosts were once again in deep trouble at 95/5 and an innings defeat looked on the cards. Dinesh Chandimal came to Sri Lanka’s rescue, scoring an unbeaten 162 off just 169 balls, studded with 19 fours and 4 sixes. He received valuable support from Lahiru Thirimanne and Jehan Mubarak as Sri Lanka hit their way out of trouble, making 367 to set a target of 176. In the 4th innings, Herath came to the party and demolished the Indian line up, taking 7 wickets and conceding just 48 runs. India were all out for 112 and lost the match by 63 runs. For his counter-attacking, unbeaten 162, Chandimal was named the Man of the Match.